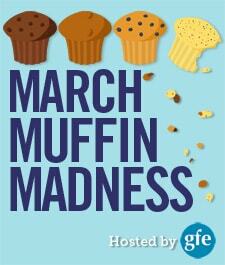 We’re heading into the final stretch for March Muffin Madness (MMM). That makes me treasure all these muffin recipes more than ever—recipes like today’s Paleo Strawberry Chocolate Chip Muffins. You only have to think of luscious chocolate-dipped strawberries to know that the strawberries and chocolate combination is one that works. With this recipe, you get that winning flavor combo in a muffin, which is the classic, no-fuss, “grab-and-go” breakfast or treat in my opinion. 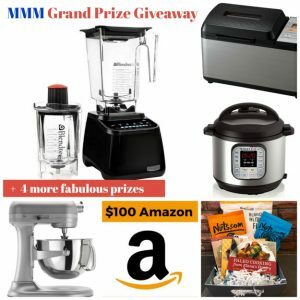 Let’s learn more about this gluten-free, grain-free (and “more free”) muffin recipe, its chef/caterer author, today’s daily prizes (two out of three of this author’s cookbooks), and, of course, the overall grand prize giveaway. Simone of Zenbelly is a self-taught, highly talented chef and professional caterer based in San Francisco. She’s also a lovely person. She eats mostly paleo and provides all gluten-free options in her business. Simone creates beautiful, vibrant, and delicious recipes as evidenced by her blog and her three cookbooks: The Zenbelly Cookbook: An Epicurean’s Guide to Paleo Cuisine, The New Yiddish Kitchen: Gluten-Free and Paleo Kosher Recipes for the Holidays and Every Day (co-written with Jennifer Robins), and Paleo Soups & Stews: Over 100 Delectable Recipes for Every Season, Course, and Occasion. Many of Simone’s recipes are the kind that you think are impossible, such as decadent paleo chocolate layer cake, paleo challah (she actually has two challah recipes on her site! ), and paleo bagels–all of which get raves! 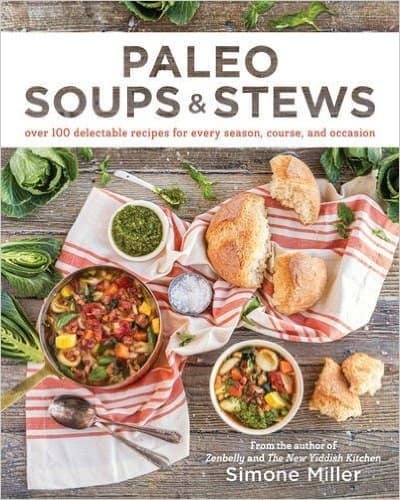 Incidentally, Melissa Joulwan does an excellent job of capturing both Simone’s spirit and her work in the Foreword that she wrote for Paleo Soups & Stews. If you use the “Look Inside” feature on Amazon, take a moment to read her words. In a blender, combine the shortening, honey, eggs, and vanilla. Blend until smooth. In a medium bowl, whisk the almond flour, arrowroot starch, coconut flour, baking soda and sea salt. Add to the blender and blend for 8-10 seconds, or until well incorporated. Stir in the strawberries and chocolate chips. Divide among the prepared muffin tin and bake for 18-20 minutes, or until a toothpick inserted into the center of a muffin comes out clean. Cool the muffins in the tin on a wire rack before removing them. As noted in Simone’s introduction, the chocolate chips can be omitted if you wish and other berries (including a mix of berries) can be substituted for the strawberries. Grain-free baked goods tend to mold faster than regular ones (because of higher protein content), so make sure to refrigerate after a day if you haven't eaten them all yet. Simone recommends Equal Exchange Bittersweet Chocolate Chips. Some folks also consider Enjoy Life chocolate chips (which are more readily available) paleo friendly. Simone said that she wanted this cookbook to be more than what you might think a book about soups and stews would be. A good example is the Harvest Chicken Soup with Sweet Potato Gnocchi recipe that’s included. It’s definitely not your basic chicken soup. She teaches you how to make the wow-worthy sweet potato gnocchi for the recipe but those who want an easier method can use spaghetti squash or sweet potato noodles. You can also see that this cookbook is about more than soup and stews by taking a look at the chapter titles: Broths and Basics, Blended Soups, Hearty Soups, Stews and Chilis, Chilled Soups, In Soup (Noodles & Other Fun Additions), On Top (Garnishes), On the Side (Breads, Crackers & Dippers) and even dessert in the final category, Sweet Soup and Cookies. Like Chocolate Soup with Graham Cracker Marshmallow Dippers. Fun! Being a huge soup fan, I can’t wait to make these recipes! Remember that you can use the “Look Inside” feature on Amazon (click on the cover image on left side of book’s Amazon page) to see specifics in these cookbooks that might appeal to you. Those muffins look divine Simone! Chocolate and strawberries is such a classic and delicious combination. They look delicious! I’ll try those for sure. I like Simone’s recipe. The Zenbelly cookbook is great for me! Love chocolate and strawberry together. The Zenbelly Cookbook would be nice. 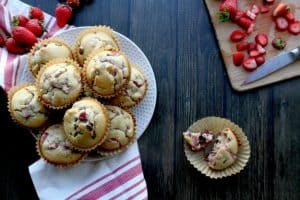 I actually hadn’t thought about putting strawberries and chocolate together in a muffin! Yum! 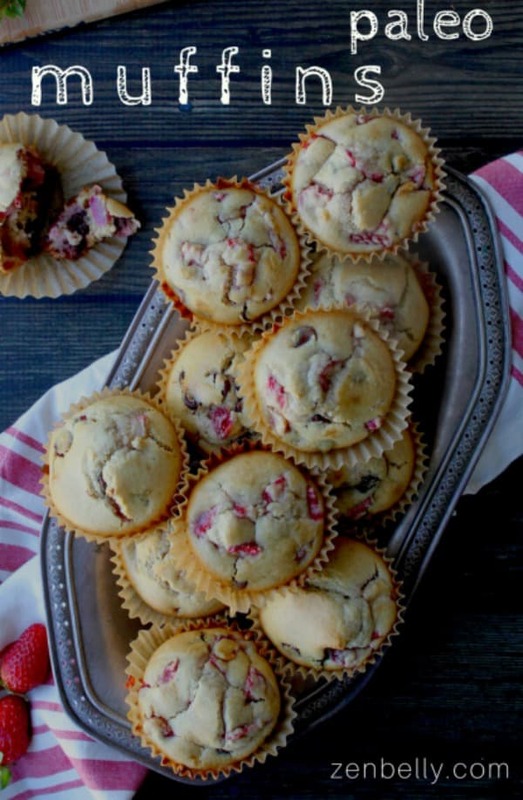 These muffins look delicious & easy to make. Thanks for introducing us to Simone’s web site as well. I’d like the Zenbelly cookbook. I need that Zen Belly cookbook! Those muffins look delicious! Zenbelly would be great! Can’t wait to try these! Nice looking muffins! 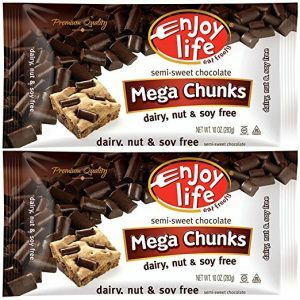 I would like the Enjoy Life Mega Chunks as I have to be soy free. Thanks for sharing another recipe idea and for the extra giveaway entry, as well. Zen belly sounds so interesting! These muffins sound delicious and I love ❤️ LOCE Enjoy Life Chocolate chips. Please choose me so I can bake more yummy treats in my kitchen. Thank you! Wow! 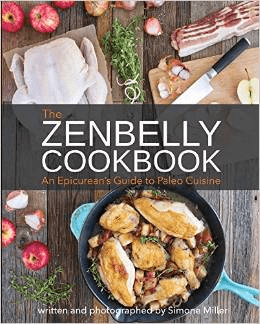 Both cookbooks seems like fantastic additions to my “cookbook” library – especially Zenbelly! The muffins look delicious too! I love strawberry and chocolate together! Either cookbook looks great! These look good… of course things usually don’t look as pretty when I do it but taste is usually OK.